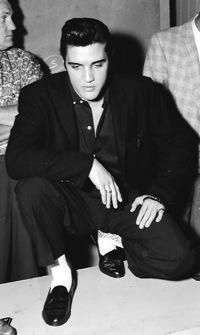 I know there are Elvis fans who enjoy spending their vacations visiting “Elvis Sites,” places connected with the King during his lifetime. For instance, I’d love to visit the area in Florida where the location shooting for Follow That Dream was done. And wouldn’t it be interesting to visit some of Hawaiian locales where parts of three Elvis movies were filmed? Most of my experience with visiting “Elvis Sites” came while I was doing the research for my Elvis ’57 book. To get a feel for what it was like when Elvis came to the Pacific Northwest in 1957, I followed his path through the five cities he played that Labor Day weekend. Here are the “Elvis Sites” I visited in those cities 50 years after that historic tour. This was Elvis’s first stop in the Pacific Northwest tour. After a 48-hour train ride from Memphis, he arrived at Spokane’s Great Northern Depot. The station was torn down in 1973 to make way for Expo ’74, the world’s fair held in the city that year. One part of the depot still remains, however. It is the 155-foot-high, brick clock tower that today stands like a sentinel in the city’s Riverfront Park, the former world’s fair site. An Elvis fan who stands at the base of the clock tower today can be sure that nearby is the spot where Elvis stepped off the Great Northern Empire Builder late on the night of August 29,1957, and reboarded the westbound train the next night on his way to Vancouver, B.C. While in Spokane, Elvis stayed at the Ridpath Hotel, located on Sprague Avenue several blocks south of the train station in the downtown area. The hotel has been closed for some years. In recent years there have been plans to convert the building to condos or commercial shops. If and when that happens, Elvis travelers will again be able to stand in the old Ridpath lobby and envision the dozens of teenagers who gathered there hoping to see Elvis on the morning of August 30, 1957. 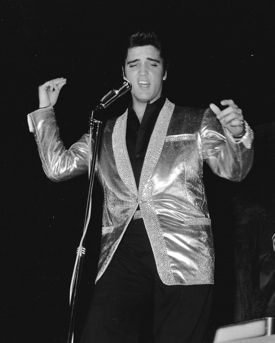 First opened in 1950, Memorial Stadium sat 25,000 spectators when Elvis appeared there in 1957. In 1962 the stadium was renamed Joe Albi Stadium in honor of a renowned local sports booster. Fifty years after Elvis left the stadium, it still sits in the northwest corner of the city, five miles from the city center. It is primarily used today for high school football games. The dirt track surrounding the original football field—the track Elvis knelt on and from which fans scooped handfuls of souvenir dirt—has long since been covered with artificial turf. Canadian National Station, now called Pacific Central Station, the point of Elvis Presley’s arrival in and departure from Vancouver, B.C., still occupies the same historic building just east of downtown at the intersection of Stadium Street and National Avenue. A terminal of the Great Northern Railroad in 1957, the station now services Amtrak and Canadian Rail, as well as Greyhound Bus. The spot where Elvis left the train on his arrival is now a shared passenger platform for trains on the north side and buses to the south. Somewhere to the east end of the platform is where Elvis stepped off the train and into a rented Cadillac for the drive to the Georgia Hotel. 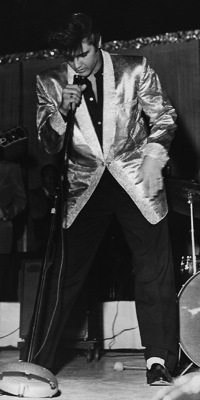 In addition to Elvis Presley, the Georgia Hotel (now the Crowne Plaza Hotel Georgia) also hosted Louis Armstrong; Nat “King” Cole; Edward, Prince of Wales; and The Beatles. Located at 801 West Georgia Street in the heart of downtown Vancouver, the lavish twelve-story hotel has undergone extensive renovations in recent years. Room 1226, where Elvis spent the night following his infamous concert on August 31, 1957, no longer exists as a guest room. It and former rooms 1227 and 1228 have been combined into the current top floor club lounge. Seven years after Presley’s appearance there, Empire Stadium was the site of another raucous concert by The Beatles. In the early 1980s the stadium was demolished, and the site was used as a parking lot for many years. However, in 2002 the old stadium location was turned into a public recreation area that today includes two soccer fields, two baseball diamonds and a dirt jogging track. Located in the southeast corner of Hastings Park, four miles east of downtown, the current Empire Fields retains the same bowl configuration as the old stadium. The pitcher’s mound on the baseball field at the north end of the bowl marks the approximate spot where Elvis performed on a makeshift stage in 1957. Of the three performing venues that survive from Elvis’s 1957 tour of the Pacific Northwest, the Lincoln Bowl is both the smallest and the most attractive. Now, as then, the property of the Tacoma public school system, the Lincoln Bowl is adjacent to Lincoln High School, located at 701 S. 37th Street in south central Tacoma. The bowl is the home field of the Lincoln Abes football team. It also hosts school district soccer matches and track meets. The small stadium, its surface and seating area below street level, sits in a natural, steep-sided hollow north of the high school. The surface of the bowl has been updated since Elvis appeared there. The natural grass has been replaced with artificial turf for football and soccer contests. The running track, on which some girls stooped to gather dirt after the 1957 concert, has been replaced with an eight-lane, hard-surface track. Neatly landscaped with trees on the higher area around it, the Lincoln Bowl is best viewed from its north end. From there, between the bowl and the school baseball field, a clear view of the entire stadium is available. 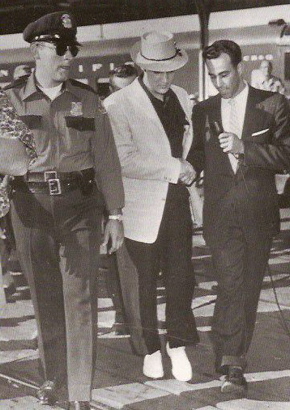 Since Elvis commuted by car from his Seattle hotel to the Lincoln Bowl, there are no other sites in Tacoma associated with his afternoon performance in that city on September 1, 1957. 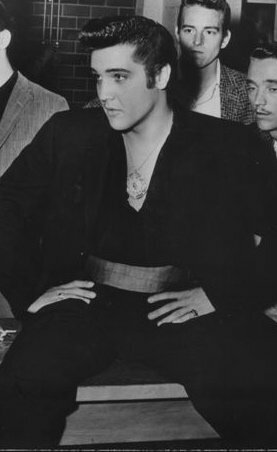 Elvis actually passed through Seattle’s King Street Station three times during his 1957 Labor Day weekend tour. He arrived there from Spokane early on the morning of August 31. Quickly changing trains, he headed north for that night’s show in Vancouver, B.C. The next day a train brought him back to Seattle for his performances there and in Tacoma. On September 2, he boarded another train bound for Portland. Opened in 1906 to service the Great Northern and Northern Pacific Railroads, King Street Station gradually fell into disrepair in the years after Elvis was there. The station was saved from closing in 1971, when Amtrak moved its passenger service there from nearby Union Station. Increasing interest in train travel led to a renovation project starting in 2003. Today, with its signature red brick clock tower, King Street Station is the largest passenger rail station in the Northwest. Quest Field, home of the football Seattle Seahawks, sits next to the station. The luxurious Olympic Hotel, where Elvis spent the night of September 1, 1957, later fell on hard times in the 1970s. Marked for demolition, the hotel was saved when public outcry led to a restoration of the Olympic. The Four Seasons Hotels, Inc., completed the remodeling and the hotel, renamed The Four Seasons Olympic Hotel, reopened in 1982 after being shut down for nearly two years. Purchased in 2003 by Fairmont Hotels and Resorts, the Fairmont Olympic Hotel is located at 411 University Street in downtown Seattle’s Rainier Square neighborhood. Sicks’ Seattle Stadium, where Elvis performed in 1957, later became a major league baseball site as the home of the Seattle Pilots during the 1969 season. 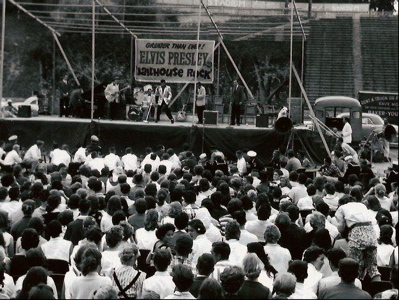 The next year both Jimi Hendrix and Janis Joplin performed concerts in the stadium, and in 1976 a professional wrestling show, featuring future Minnesota Governor Jesse Ventura, was held there. By then the stadium was falling into disrepair, and the opening of the Kingdome in 1977 marked the end for Sicks’ Stadium. The stadium was demolished in 1979. Today a Lowe’s Home Improvement Warehouse at 2700 Rainier S. occupies the entire site. A plaque at the front entrance marks the original location of home plate on the baseball field. The stage on which Elvis performed in 1957 stood near second base, the location of which today would be in the store’s lumber section, about forty yards southwest of the plaque at the store’s entrance. The view from “Tightwad Hill” is still available. Located to the east beyond the stadium’s left field fence, the hill is now covered with apartment houses. However, there is a parking lot between the crest of the hill and the apartment buildings. Off McClellan Street, one block east of Martin Luther King Jr. Boulevard, is an access road leading up to the parking lot, from where 16-year-old Jimi Hendrix and many others watched Elvis perform for free, although from a distance, on the evening of September 1, 1957. Located at 800 NW 6th Avenue, at the northern end of downtown Portland, Union Station has retained the name, location, and feeling it had when Elvis Presley arrived there the afternoon of September 2, 1957. Originally opened in 1896, the station today is home to Amtrak and Greyhound Bus. The station is directly accessible via off-ramps from both the Broadway and Steel Bridges across the Willamette River. For seven decades after it first opened on September 8, 1912, the Multnomah Hotel was Portland’s most prestigious up-scale hotel. During those years, it accommodated most celebrities who came to town. In the 1980s, however, the establishment experienced financial difficulties, which forced its closure in 1991. “Embassy Suites” purchased the facility, restored it to its former glory, and reopened it in 1995. Under the name “Embassy Suites Hotel Portland-Downtown,” the historic Multnomah Hotel, at 319 SW Pine Street, appears much the same as it did 50 years ago, when Elvis Presley spent the night there on September 2, 1957. Converted from a dog racing track to a baseball stadium in 1956, the year before Elvis appeared there, Multnomah Stadium was the home of Portland’s minor league baseball teams through 2010. In 1966 the Multnomah Athletic Club sold the stadium to the city of Portland, and it was renamed Civic Stadium. After a 2001 renovation, the stadium was given the name, PGE (Portland General Electric) Park. Located at 1844 SW Morrison Street, in the northwest corner of Portland’s downtown area, PGE Park today includes many modern amenities, while retaining the classic feel of the old Multnomah Stadium that hosted Elvis in 1957. The Multnomah Athletic Club, where Elvis held his pre-concert press conference, is located on Salmon Street adjacent to the stadium. The best view of the interior of the stadium is from the S. 18th Avenue side. As part of the 2001 renovation, the wall on the east side of the stadium was torn down so that pedestrians could peer through a wrought-iron fence and see the playing field, 26 feet below street level. "The pitcher’s mound on the baseball field at the north end of the bowl marks the approximate spot where Elvis performed on a makeshift stage in 1957."